As I reflect back on the show from yesterday, I want to let you know what happened during the show and provide my observations of the aftermath. I have to tell you, it is absolutely maddening when something doesn’t go right during a live broadcast, which happened at the start of the show. Of all days to experience an issue, yesterday was not the day I wanted to deal with Murphy’s Law! As I started the show and began my monologue, I could hear a repeat of what I was saying that followed with a ~10 second delay. At first, I worried that this feedback was being broadcast. I then reasoned that it couldn’t be, because my call-screener was not alerting me to anything wrong. As I focused on my monologue, it was hard to fight the urge to trouble-shoot the issue. I told myself that I had a live audience and had to keep forging ahead, despite the fact that I was hearing my own words repeated back to me in my headset. When I ended my monologue and brought Ivan on the show, it gave me a brief respite while he talked so I could try to understand what was happening. I thought that one of my audio feeds must have been causing the problem and MUTED my broadcast feed, thinking it was something other than what it was! Thank God Ivan was on site. He rushed into the studio and told me he couldn’t hear anything. I took my feed off mute and stumbled into a conversation with Peter Singleton, after having given my introduction while muted. Sheesh! After I greeted Peter and gave him an opportunity to speak, I noticed something. I had opened up a separate browser window in addition to my broadcast page. Unbeknownst to me, when the show started, that other browser window, which was on the show page, started playing my broadcast, with a 10 second delay. No one could hear it except me! When I realized what I’d done, I immediately closed that window and, to my relief, the feedback stopped! I kept moving forward in my conversation with Peter Singleton, thinking that the rest of the show would go off without a hitch. Au Contaire! The show continued to move forward on schedule, leading up to the second biggest “get” I’ve ever had (Jedediah Bila was the first): an interview with Stephen Bannon! I was really looking forward to the conversation, but as the show approached the time of his call-in, Murphy’s Law visited me again: he wasn’t there! I felt terrible keeping Adrienne Ross on the line because I knew she still wasn’t feeling up to par. On the fly, I decided to thank Adrienne and end my conversation with her. The problem was, my next guest wasn’t there! I segued into my recorded conversation with O.P. Ditch. O.P., if you’re reading this, you saved my bacon! After I started the audio clip, I sent an email to Stephen Bannon. My message was simple: “Stephen, waiting for you to call in to the Roderic Deane Show at 877-478-5783”. I had to split my audio file with O.P. into two parts, thanks to the constraints of BlogTalkRadio. By the time I had found Stephen’s email address and sent him an email, the first clip of my conversation with O.P. was winding down. I provided a brief introduction to my second clip with O.P. and started that audio file. To my never-ending relief, I noticed a new call on the line and I waited to be alerted by Ivan, my call-screener. As I watched the monitor, all of a sudden the notice came up: Stephen is on! I now had to figure out how to end the audio clip that was playing. As Stephen waited in the “wings”, so to speak, we both listened to my conversation with O.P. When the audio clip provided an appropriate break, I cut it off and sequed into an introduction of Stephen Bannon, after offering an apology to O.P. Stephen delivered a great conversation for the rest of the show. As I looked at the time, I thanked Stephen for calling in and went into my lead-out routine. The show ended with 30 seconds to spare. After the show was over, I knew I wasn’t done. I had to contend with the “technical issues” at the start of the show. Live listeners are great, but the beauty of BlogTalkRadio is having your broadcast available to anyone at the time of their choosing. I knew I had to “fix” the start of the show. I went back to my studio and re-recorded the entire start of the show, including my monologue. I copied the newly-recorded start into the downloaded show, replacing the live version. After finishing, I uploaded the new audio file to BlogTalkRadio in the hopes that archive listeners would not have to experience all my technical difficulties. By 4:00pm, 3 hours after the show ended, the new audio was available on BlogTalkRadio. I emailed the audio file to Stephen Bannon’s technical team, at his request. At that moment, I suddenly started feeling exhausted, having FINALLY completed the day of my blockbuster show. But I wasn’t finished. I had promised Stephen Bannon that I would listen to his radio broadcast later that night. I have to be honest. I did stay awake long enough to listen to Stephen Bannon’s show, but I don’t remember anything about it. As soon as it was over, I turned off my laptop and went to bed. It was 9:30pm Central Time. Former Alaska Governor Sarah Palin’s speech before the World Knowledge Forum in Seoul, South Korea this October 11 is to provide a “US leadership perspective on how to lead the world out of the latest [economic] crisis, Hyun-kyu Shin – Samji Chung writer and Soyoung Chung, editor, Maeil Business Newspaper reported September 1 in Korean and English. Perhaps Providentially, a Google machine translation lists Gov. Palin as a “Presidential Candidate.” Though far from perfect, the machine translation delves into a synopsis of Gov. Palin’s policy positions on the deficit, debt, and quantitative easing. It compares and contrasts today’s economic climate with the Great Depression and Obama’s handling of the economy with President Franklin Delano Roosevelt’s. The machine translation lists Gov. Palin as the World Knowledge Forum’s keynote speaker. Gov. Palin will be among 250 leaders from 40 countries, including former UK Prime Minister Gordon Brown. Gov. Palin’s speech will be in Vista Hall at the Sheraton Grande Walkerhill Hotel, Seoul, South Korea on Tuesday, October 11 at 0900 / 9:00 AM Korea Standard Time. 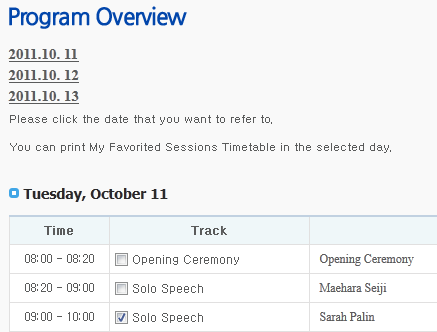 Since KST (UTC+9) is 13 hours ahead of Eastern Time, for us, her speech will be October 10, 2011 at 2000 / 8:00 PM. Registration fees for the World Knowledge Forum range from USD $500 to $800. Her speech is on the Presentation Track and will be moderated by Riz Khan, an Al Jazeera English Anchor. In a telephone conversation I had with Jennifer Moon at the World Knowledge forum, she indicated that Gov. 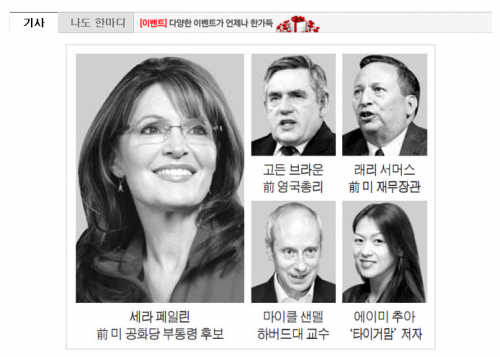 Palin’s speech would be broadcast on NBN, a South Korean cable TV channel, which is part of the Korean Broadcasting System. Photo by Melissa, retrieved from HillBuzz and posted by Kevin Dujan. H/T Josh Painter for lead to photo. The event is being aggressively promoted throughout South Korea as evidenced by this billboard featuring Gov. 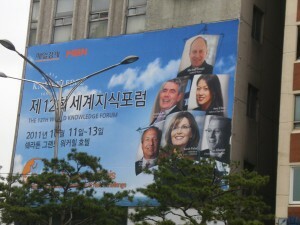 Palin’s photo in downtown Seoul. This is Gov. Palin’s second trip to the Pacific Rim and could be historic. Her first ever Washington Speakers Bureau speech was delivered in Hong Kong, in September 2009. This year, Gov. Palin delivered her epic My Vision of America speech in India, gave an exclusive interview to India’s Koël Rinchet, then made history as a private citizen breaking bread with Israeli Prime Minister Benyamin Netanyahu for Purim. Reviews Are In For Palin Hate Movie: “It’s Rotten” They Say. It Joins McGinnis/Johnston Flops. When the positive movie about Palin “The Undefeated” came out the left hate sites were in a frenzy to describe how, in their opinion, poor the attendance was in the movie houses, and the lack of good reviews. The left’s latest one-two literary punch against Sarah Palin is proving to be an ineffective combination that misses its mark. Disgraced author Joe McGinness’ The Rogue: Searching for the Real Sarah Palin and Caribou Country clown Levi Johnston’s Deer in the Headlights: My Life in Sarah Palin’s Crosshairs were both released on Tuesday, but the book-buying public apparently couldn’t care less. At the time of this writing, McGinness’ hardcover hit job is sales-ranked #74 by Amazon and #208 at Barnes & Noble. Johnston’s joke of a book fares even worse, at #888 in sales at Amazon and #20,049 at Barnes & Noble. It’s not like both books and their respective authors suffered any from lack of promotion by their publishers and left wing advocate bloggers. Random House/Crown conducted a major roll out campaign for The Rogue, lining up appearances for McGinnis to promote his book on NBC’s “Today Show” and ABC’s “The View,” among other small screen venues. Cartoonist Garry Trudeau even signed on to a rather unique agreement to excerpt McGinness’ drive-by character assassination of Sarah Palin in his “Doonesbury” strip. And The Rogue also got featured reviews by liberal newspaper mainstays The New York Times, Washington Post, and the Los Angeles Times. Granted, the reviews were much harsher than Random House had expected, but as they say in the PR world, any publicity is good publicity. And speaking of publicity, McGinness and his 300-plus pages of Palin smears is currently in the vortex of a major controversy of firestorm magnitude, yet sales still remain tepid at best. The massive hype surrounding McGinness has overshadowed the promotional effort for Johnston’s Deer in the Headlights, but both Palin character assassins benefited from friendly television venues where they hawked their books, and nutroots left blogs have hyped both volumes as the knockout punches that would surely spell the political end of the first woman to govern Alaska and campaign as the Republican Party’s vice presidential candidate once and for all. Yet despite all of this, both books have failed. What went wrong? The left is already deep into the spin cycle, attempting to explain away the poor performance of the McGinness and Johnston books as a waning of the public’s interest in all things Palin. But the Wasilla Warrior’s name in the headlines still draws viewers to their television screens, sells magazines and guarantees web page traffic, so that excuse doesn’t hold water. We submit that the public has not lost interest in Sarah Palin, but it recognizes a smear job when it sees one. The left, which can always be counted on not to learn a thing from history, has been to this well so many times that John and Jane Q. Public are no longer buying the lies. Palin-flamethrower, Geoffrey Dunn of the Huffington Post released The Lies of Sarah Palin: The Untold Story Behind Her Relentless Quest for Power May 10th and Frank Bailey, former Aide to Palin, teamed up with Palin critic Jeanne Devon to release Blind Allegiance to Sarah Palin: A Memoir of Our Tumultuous Years on May 24th. Ardent opponents of Sarah Palin have been highly-anticipating these books which promised to tear down Palin’s public image for the long-term. Interestingly, Geoffrey Dunn’s book has not even hit Amazon’s top-100 list since its release; and after a week of media coverage including appearances on NBC, ABC’s The View, Fox News, CNN, and many more, Frank Bailey’s “memoir” disappointingly debuted at #40 and has already fallen to #75. While reasonable voters notice that perhaps Americans are beginning to tire of the anti-Palin volume, others are sure to argue that Americans simply don’t care about her at all, even though the latest headlines which seem to be tracking her every move impeccably could be enough to put that idea to rest. One thing is sure for Palin as she moves toward making her 2012 decision. She enjoys the luxury of knowing she has been thoroughly vetted and scrutinized for the last two years. While anti-Palin readers have lined their ammunition up one year before a presidential campaign, her supporters are left wondering who is left in Alaska to interview. Because on the basis of Geoffrey Dunn’s and Frank Bailey’s accompanying Palin-bombs, what they’ve come up with so far doesn’t seem to be effectively extinguishing the grassroots energy Sarah Palin has uniquely created and maintained. The Rogue was supposed to have found success where the Dunn and Bailey efforts met failure, but McGinness made a fatal mistake. The author bet his book on hollow promises from an Alaskan blogger who fed McGinness a long list of juicy allegations, but few real people were willing to put their names behind the rumors. McGinness claims that the reason for the lack of any compelling evidence in his book is that people were fearful for their very lives. Were this the case then why are Jesse Griffin and the members of his gang of Palin-hating bloggers still alive and well in Alaska? No, the reason that McGinness’ book is such a joke is that there’s literally no there there. The rumors are anonymous and unsubstantiated because there’s no truth to them, much less a single shred of compelling evidence to support them. Even liberal reviewers, who would otherwise be favorably disposed toward McGinness in his attempt to take down Clan Palin, recognize a lack of substance when they read it. Like the Dunn and Bailey assaults on Sarah Palin in May, the attempted September slayings of the Mama Grizzly by McGinness and Johnston are doomed to be abject failures. 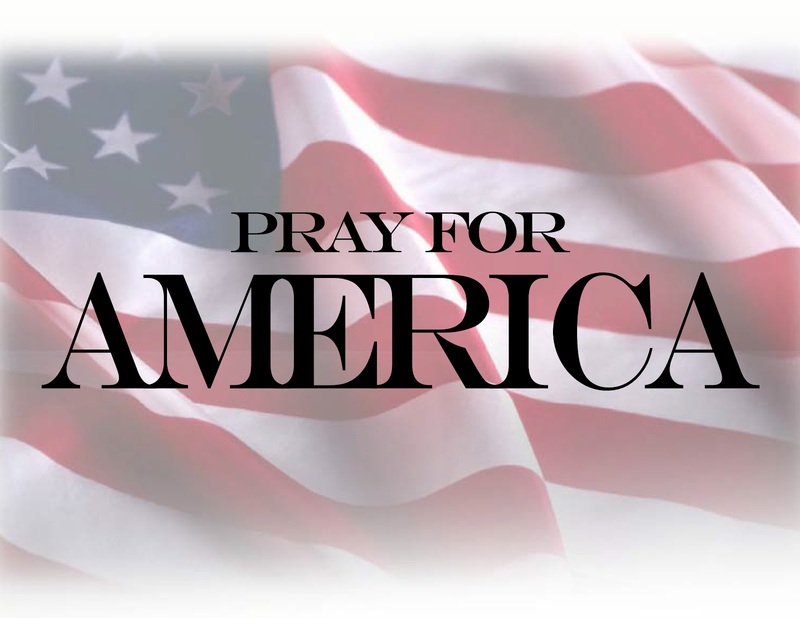 “That’s why I want a presidential candidate who has no history of cozying up to terrorists; nor do I want a candidate friendly with religions and countries which do not denounce terrorists; or who allow illegal immigrants to come here; or those that support socialist policies. “That’s why I want to see Sarah Palin run.